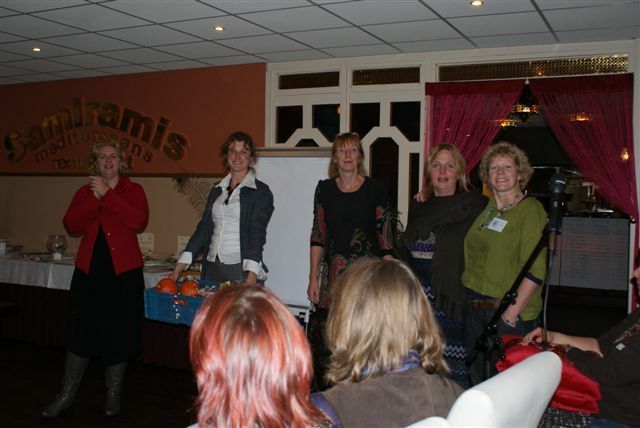 Yesterday, I – together with 66 rural business women- attended a meeting of the rural women’s business network ‘Wichterwest’ at Restaurant Samiramis in Grootegast. The establishment of women business networks was initiated by Groningen Province in an attempt to stimulate networking amongst rural business women in the province. Today, each region within Groningen province has a rural women’s network. In the Western region of Groningen province (a.k.a. Westerkwartier) the network is called ‘Wichterwest’ and is organised by the project leader ‘Vereiniging Groningen Dorpen’. ‘Wichterwest’ acts as a platform for business women to network, to exchange ideas and to receive information about business. The organisers also arrange offers for business courses and trainings. For example, the organisers are arranging a new training programme which will focus on three different business aspects: a) business start-ups, b) business management and c) market/ marketing strategies. To respond to the great interest of business women in the network and to accommodate its growing number of participants, the organisers are now considering options to set up a foundation with the aim to increase income and offers. Yesterday’s meeting started with a speed dating session in which everybody got to know the fellow participants and their businesses. I was impressed by the variety of activities carried out by the women of the Westerkwartier. For example, I met a photographer, a Bed & Breakfast owner, an administrator, a clothes designer, several advisors, an interior designer and the owner of an online farm shop for regional products. The evening proceeded with an exercise to practice efficient networking skills and a delicious three course menu made of organic products produced in the Westerkwartier. Filled with food, excitement rose as the winners of a lottery game were announced. Each business woman was asked to bring a gift made by her company. By winning vouchers for advice, massage and acupuncture sessions, bags of sheep wool and cushions for man and beast, everybody was able to get an impression of the variety of products offered by business women in the Westerkwartier. The evening was completed with three different workshops concerning a) optimal business plans, b) press releases and c) the importance of the entrepreneur for making business. Even though I am not a business women myself, I returned home filled with positive impressions regarding the innovative spirit and versatility of business women in the Westerkwartier- and a business arrangement made during the networking game- let me recall, I said I was not a business women? This entry was posted in Education, Regional Development, Rural Development and tagged business network, local economy, Regional Development, regional learning, Rural Development, Westerkwartier, women by Wiebke Wellbrock. Bookmark the permalink.